Do women executives harbor fears of holding positions of power and authority? Women agree that there is a need for them to take on stretch roles and assignments that will help them get noticed. On the other hand, women will over-analyze the challenge and shrink away from the work for fear of failure or the extra strain it will put on their home life; whereas men will put their hands up and be prepared to “learn by doing.” Unless challenging opportunities are not sought to prove one’s competence, how can you be entrusted with important clients and high-level roles? This dichotomy gives an impression of whether women managers—at least some of them—really want to succeed, as they often complain they cannot due to various organizational factors. Or do they, in fact, harbor the fear of holding power and authority deep within them, simply because it will challenge the current power structures in organizations. Some competent young women fear success because they believe it will cost them socially. Others claim that actually the major force holding women back from success and achievement is their wish to be taken care of. An article in Fortune (2003) that featured the 50 most powerful women in business. The writer of the article also wondered whether women really want power. “Many fast-track women are surprisingly ambivalent about what’s next. Dozens of powerful women we interviewed tell us that they don’t want to do something exceptionally good as running a huge company, they merely want a decently paying honorable job”. Thus, this dilemma prompts them to choose “prevention” strategies—avoiding failure—rather than “promotion” strategies—actively driving success. Men and women have different perceptions of power. Men think about power as more competitive and hierarchical, while women think of it as more cooperative and interdependent. However, women’s perception of power as an instrument of public purpose rather than as a tool for personal ambition could produce radical changes in organizations that are currently imbibed in a hierarchical notion of power over others. New research suggests that women are not in leadership positions, among other things, because they do not want the jobs as much as men do. Shocking as it may seem, in one of the studies conducted on 650 recent MBA graduates, researchers had participants rank their current position in the industry, their ideal position, and the highest position they could realistically attain. Women had no doubt that they could realistically attain the same level of success as men, but they ranked their ideal position lower. Another study explains that finding by suggest­ing that women have more negative associations with power than men do. This is because women expect more stress, burdens, conflicts, and difficult trade-offs to go with high-level positions. Powerful positions stress women out because they have less time in which to attain a greater number of goals. • Is it possible to be a woman and a manager without falling into a male stereotype? • Is it possible to be competitive and ambitious without compromising with a woman’s identity and self-image? • Is it possible to move out of the female stereotype and be seen in a new light? 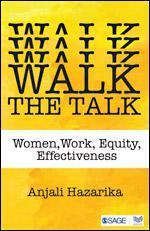 Anjali Hazarika in her new book ‘WALK THE TALK’ takes us through the invisible barriers that a woman encounters during her professional career. Her book is a ‘call for action’ to create an ecosystem of empowerment. Grab your copy today and find out how our author proposes to close the gaps between Women, Work, Equity, and Effectiveness!